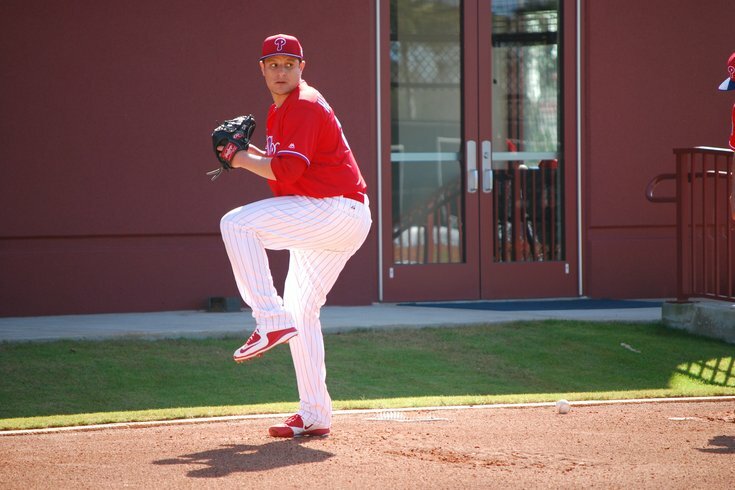 CLEARWATER, Fla. – Veteran right-handed relief pitcher David Hernandez, the front-runner for the Phillies closer job, has tenderness in his right elbow, according to manager Pete Mackanin. Hernandez signed a one-year, $3.9 million contract in December -- the only major league free agent contract the Phillies doled out this winter -- but hasn’t pitched in a game since March 1. So is he in pain? Mackanin is responsible for updating the media with injury updates, but apparently hadn't received a clear update from his own bosses. So general manager Matt Klentak clarified Hernandez's status after announcing that Aaron Altherr would miss 4-6 weeks following wrist surgery. "Triceps tendinitis," Klentak said. "He is supposed to throw (on the side on Wednesday). More of a day-to-day thing." When approached and asked before Mackanin spoke why he hadn't pitched in a game in a week, Hernandez never gave the impression that there was an injury issue keeping him off the field. Hernandez said he’d likely get back into a game later this week. His manager seemed a little more worried about the pitcher’s status.